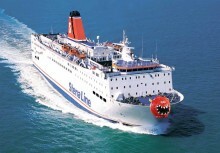 With Red Nose Day just around the corner, leading ferry company Stena Line decided it would be good fun to see what their ships might look like bedecked with a red nose! Onboard their vessels this week there will be a host of fundraising activities including a range of specially created red nose muffins, sales of which along with other activities will go to Comic Relief. With Red Nose Day just around the corner, Ireland’s leading ferry company Stena Line decided it would be good fun to see what their ships might look like bedecked with a red nose! Onboard their vessels this week there will be a host of fundraising activities including a range of specially created red nose muffins, sales of which along with other activities will go to Comic Relief.